Performers include: Jamie Bamber, Jennifer Finnigan, Bill Irwin, Alfred Molina, Sarayu Rao, Ving Rhames, Keong Sim, and Emily Swallow. 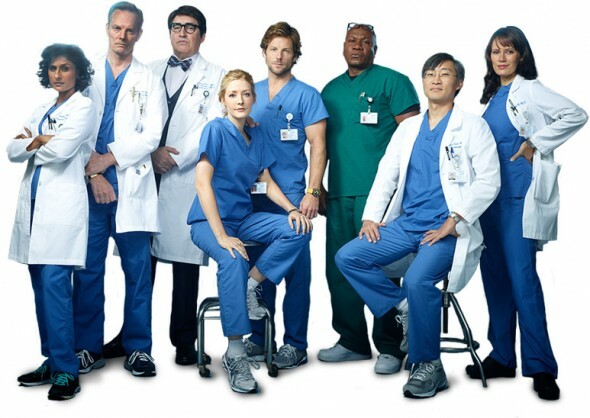 This medical drama follows the staff of Chelsea General Hospital in Portland, Oregon as they push their abilities and confront their personal and professional failings. Doctors face life-and-death decisions every day as they fight against often-impossible odds to save their patients. When things don’t go as they should, it’s up to their medical colleagues to determine what went wrong and what can be learned. Every Monday, the doctors of Chelsea General must gather with their peers for a confidential review of complications and errors in patient care. Leading the hospital staff are Doctor Harding Hooten (Alfred Molina) and Doctor Jorge Villanueva (Ving Rhames). Hooten is the steely-eyed Chief of Staff, speaks softly but carries a massive stick. He was nicknamed “Hardly Human” long ago for his exacting, punishing ways during the weekly morbidity and mortality meetings. Villanueva, known as El Gato, is a giant of a man. He is also perhaps the most celebrated trauma chief in the country — clearly the elephant in this circus. El Gato’s seat-of-the-pants diagnoses are the stuff of legend around Chelsea General. Doctor Tyler Wison (Jamie Bamber), a hotshot neurosurgeon who has a well-earned god complex. Doctor Tina Ridgeway (Jennifer Finnigan), a compassionate neurosurgeon who’s willing to fight for cases that may seem like lost causes to others. Her home life is in turmoil so she finds refuge at the hospital. Doctor Sung Park (Keong Sim) is a Korean-American and is abrupt socially and English-challenged. He’s also ambitious to the core with his searing intensity being palpable. Doctor Sydney Napur (Sarayu Rao) is a cardiothoracic surgeon who’s married to the job. A compulsive multi-tasker, she speaks quickly and takes absolutely no prisoners. Doctor Buck Tierney (Bill Irwin) is the hospital’s Chief of Transplantation. A man driven to the point of bullish, he is least liked among the Chelsea General staff. Doctor Michelle Robidaux (Emily Swallow) is a twenty-something resident. Inexperienced yet eager, she is finding her footing among experienced giants. Hooten and Buck find themselves facing off in court against attorney Mitch Tompkins (guest Anthony Heald) after a grieving son refuses to comply with his mother’s final wishes. Sydney’s outrage over the health of a morbidly obese 16-year-old boy further strains her relationship with Lieberman (guest Jonathan Silverman). And a seemingly harmless patient (guest Kenneth Mitchell) puts one of Chelsea General’s own in grave danger. First aired: April 8, 2013. What do you think? Do you like the Monday Mornings TV series? Do you think it should be cancelled or renewed for another season? Monday Mornings: To Be Cancelled or Renewed for Season Two? Monday Mornings was an excellent look into the emotional as well as the professional lives of a group of especially good medical doctors. Well written, well played, great entertainment….yet, in the infinite wisdom of the cancellation gods, this very good series was cancelled abruptly without a second thought as to who might really make up the audience. This was a HUGE mistake !! Bring back Monday Mornings !!! This was a great show! I loved it. Why was it cancelled? I wish they would bring it back. I waited for it for two years. Please don’t cancel Monday Mornings I’m really starting to get to know the people and think it’s great. I loved this show. It should never have been canceled. This time they got it wrong. They really screwed this show. Saw the first ep in Las Vegas and loved it. Then couldn’t find it again. Bring back Monday Mornings and SMASH. Dump the Bachelor/Bacheloretts a n d several e real more Reality Shows.